Happy Memorial Day everyone! Hope you all have a fun, festive and safe holiday. Exactly two years ago today, Disneyland and Walt Disney World held a Monsters University themed 24 hour all-nighter event at the parks (from 6 a.m. on May 24, to 6 a.m. on May 25) to kick off that year's "Monstrous Summer." In Disney World, just the Magic Kingdom was open for those 24 hours straight, while in California, both Disneyland and California Adventure stayed open. During these 24 hours, there was extra entertainment, characters wearing their pajamas and (of course) some exclusive merch...including these Monsters U buttons/pins that were given out to guests! 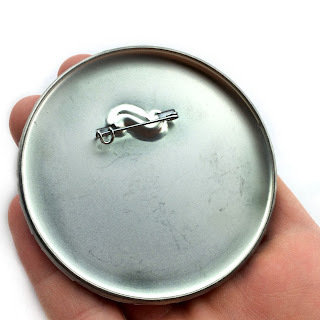 From what I understand, there wasn't just one way to get a hold of these pins; some were given out to attendees in the parks, some were given out to those that carpooled with three or more people, some were given randomly to those parking in the Disney parking lots, etc. In addition to these four buttons, there was a JOX fraternity one, a PNK sorority one and one that said "I Had a Monstrous Summer with Disneyland [or Disney's California Adventure] Today" as well. One additional button that I know I'm missing is the Mike and Sulley pool party one seen HERE. I might just have to track that one down (along with the other three mentioned above) since I have most of the others. A big thanks to my good friend Adrianne for snagging these for me during the 24 hour event! Since I wasn't able to attend at the time, he was nice enough to hook me up and got them to me recently (when we met up at the Star Wars Celebration). Really cool stuff! Remember that Monsters University "pool party" button I mentioned above, but didn't have? 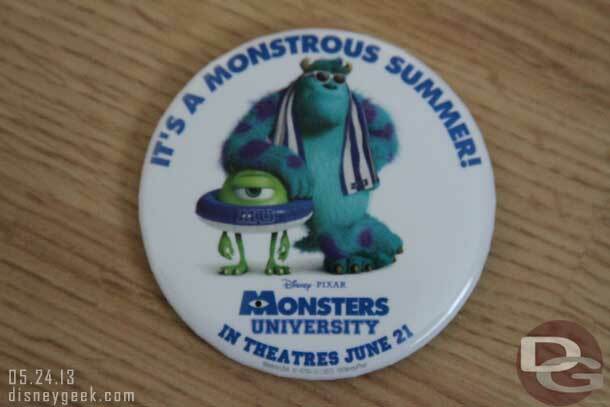 Well it has now been added to my collection of the 24-Hour Monstrous Summer Event button/pins! A huge thanks to blog reader Paulina (Twitter @HeartDisney10) for hooking me up with this. She was able to find me at the D23 Expo and handed this over as a fun little surprise (among a couple other items I'll be posting soon). That was so awesome and thoughtful- again, thanks so much! It looks great.